Association of Community Ministries – A faith-based network of Community Ministries. A faith-based network of Community Ministries. Welcome to the Association of Community Ministries Website. Louisville, Kentucky is proud to be a national model for its faith-based network of Community Ministries. There are 15 Community Ministries in the Louisville area that serve residents from every zip code. Each community ministry is supported by member churches and faith-based groups residing in their service area. This service helps provide a caring, responsive environment to which families in crisis come to receive assistance in resolving their crisis. Job Readiness helps individuals prepare for getting a job, from creating a resume, to interviewing to starting their first day of employment. Special seasonal programs are often offered, such as Thanksgiving Meals, Winter Coats, and Christmas programs. Watch the video below from the ABC News World News Tonight with Diane Sawyer titled “Going Home – Hope in Louisville”. Adult Day Care provides a structured program balancing physical & cognitive activities designed to help frail older adults function at their highest level for as long as possible. With the assistance of other community services, Meals on Wheels works through many of our community ministries, as a base for the distribution of home delivered meals to the home bound of our community. Our Community Ministries can be a resource for those needing housing. Contact the community ministry in your Zip Code area for assistance. The individual ministries serve residents in specific zip codes in their general location. Those looking for assistance should contact this zip codes community location directly. See locations listed below! 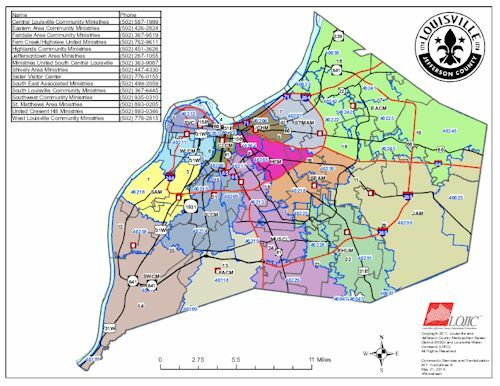 Community partnerships with the Louisville Metro Government, Louisville Metro Council, Louisville Gas & Electric Company, Louisville Water Company and the Metropolitan Sewer District resulted in $1,868,445 in grants to help make Louisville a stronger more vibrant compassionate community for all who live, work, learn and play in this great city! Copyright © Association of Community Ministries, Louisville, KY. All Rights Reserved.